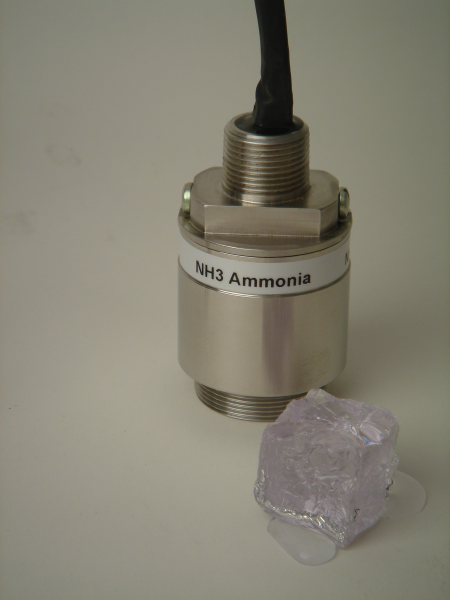 A new fail-safe ammonia detector designed for commercial/industrial/institutional refrigeration has been announced by Sensor Electronics of Minneapolis. Ammonia refrigeration is used in cold-storage plants, sky scraper air-conditioning, flash-freezers, hospitals, commercial ice-makers, frozen-food warehouses, beverage production lines and similar applications. While ammonia’s pungent odor is quickly recognized, continued exposure to ammonia can mean permanent lung damage, blindness and even death. Besides checking for ammonia leaks, this new detector continually checks itself, flashing an immediate alarm the instant its sensing cell fails. Detectors team with dedicated transmitters that show ammonia levels on digital readout panels; color coded LED’s glow green/amber/red if ammonia concentrations increase.